And now a warning to Bible Believers…..
John O’Keefe – It is a name you clearly can’t trust…..because his last name is derived from a beer company. You heard it from us first! And even worse….this beer company is from Canada (but now conveniently owned by Molson Coors as a cover up to hide this fact!) We ALL know that Canada has socialized health care – and that is blatantly communist. Moreover…. John likely is FOR healthcare. John has chains around his neck. Indeed – he has all the characteristics of an anti-war peacenik (we know this is wrong because we use the OT to prove it). Its pretty obvious to those with a keen eye for discernmentalism. PS we are thankful for several tips from Fox News. 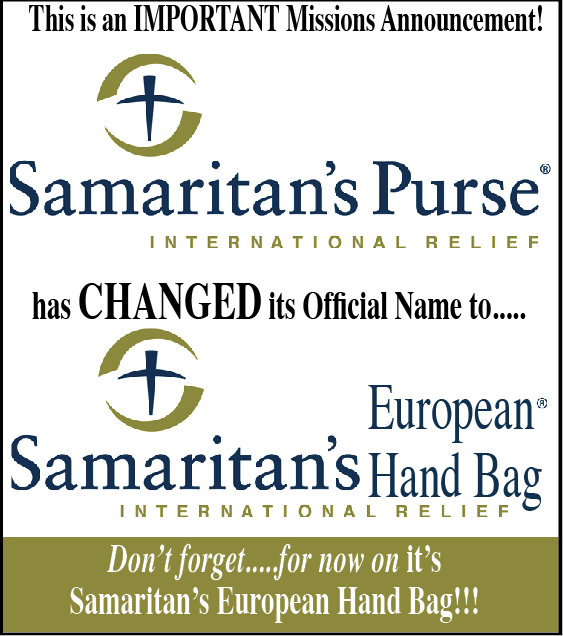 Because HELL is hot, and we don’t want anyone mixing our ministry with actual purse wearing men (wink wink), we decided to change our name. This message is completely endorsed by none other than mighty TRUTHSLAYER. Defender of literalism and truthiness. Because regular truth just isn’t enough.